This is a simple cocktail in the classic definition of a cocktail. Back in the day the word “cocktail” was specifically for drinks that consisted of just liquor, a little sweetener, and some bitters. That’s it. You can think of the classic old fashioned for the basic definition of a cocktail. 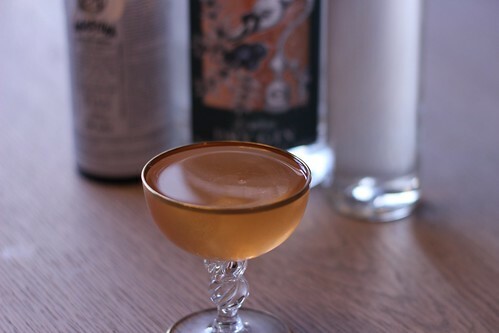 Very simple, and they can be very nice variations on just a shot of liquor. I find it interesting that the Lommebogen recipe is pretty classic, with the sweetener, while the Savoy and Café Royal omit the sugar and up the bitters. I used one of my favorite sipping gins for this, Sipsmith, since the gin is obviously very present here. I prefer the Lommebogen recipe as I find with this style of drinks the sweetness is nice to round the edge off the liquor. I might use 2 dashes of bitters instead of one, and orange bitters are quite nice. I feel like the Savoy recipe isn’t quite as nice with the strong bittering. I like Sipsmith for sipping because it has a nice flavor and not much bite to slap you with. I feel like adding a lot of bitters overpowers the botanicals in the gin. Maybe a stronger gin would be up to it, but I’ll stick with Lommebogen on this one.